The bull roarer is a classic example of parallel development. According to a modern reference, the ancient Egyptians had a device like this that they swung to produce rain, the author interpreting the practice to "making thunder" so the gods should then send rain. 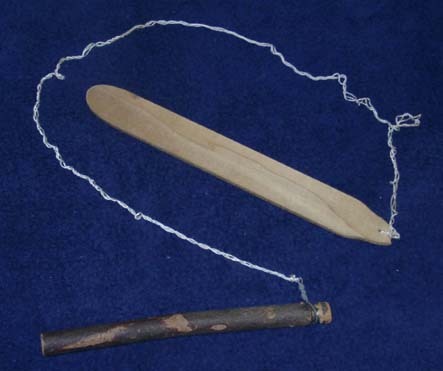 American Indians reportedly also had these noise makers. The period literature that I have reviewed does not mention the bull roarer or any other device which would seem to be similar. However, the toys are the model of simplicity, consisting in their most elementary form as a flat piece of wood with a string tied to the end. It would seem highly likely that they were used during the civil war period by boys indulging in the universal children's pastime of making noise. So the search continues to find some mention of them. A word of caution on this toy for parents. The string for the bull roarers we carry is about one meter long. When added to the flat piece of wood on the end, the total length is about four feet. I would recommend shortening the string if a smaller child wished to use the toy so that the total length is less than the height of the child or restrict its use to children four feet tall or more. The reason for using a shorter string with smaller children is to make it easier for them to swing the toy and get noise. A suggestion for all users of the toy. If you want to get any sound as soon as possible, before swinging the toy, give the string a twist so that the blade is turning when you hold the toy by its handle with the blade hanging down. If the blade is still when you start swinging, you will eventually get sound but you will have to swing the toy by the handle for a while first.